Vietnam is famous for their amazing street food and distinct flavours, so when planning our trip to Vietnam last year, we knew it was essential we did some type of foodie tour during our stay, aside from the Vietnamese cooking class in Hoi An we did later in our trip.. 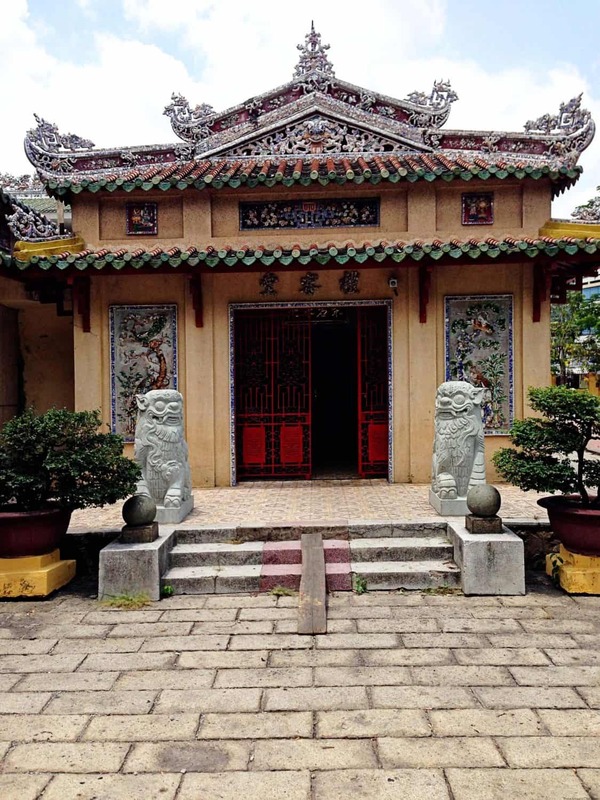 Pretty early on in our planning, I stumbled across a great blog, The Dropout Diaries, by an Aussie expat Barbara now living in Ho Chi Minh City with her Vietnamese partner Vu, and their 2 young children. 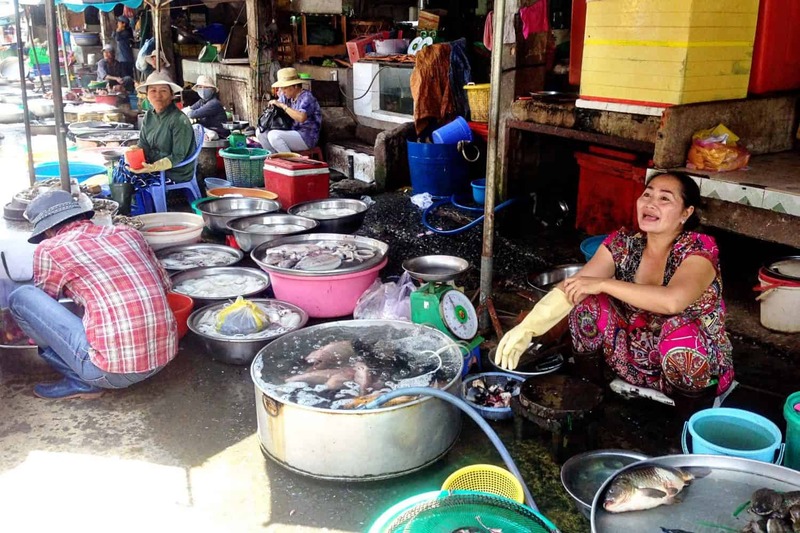 Barbara has some great articles on travelling Vietnam with kids, but it turns out they also run a street food tour in Ho Chi Minh City, Saigon Street Eats. There were a few other similar tours I found during my search, but many of these were conducted via motorbike. 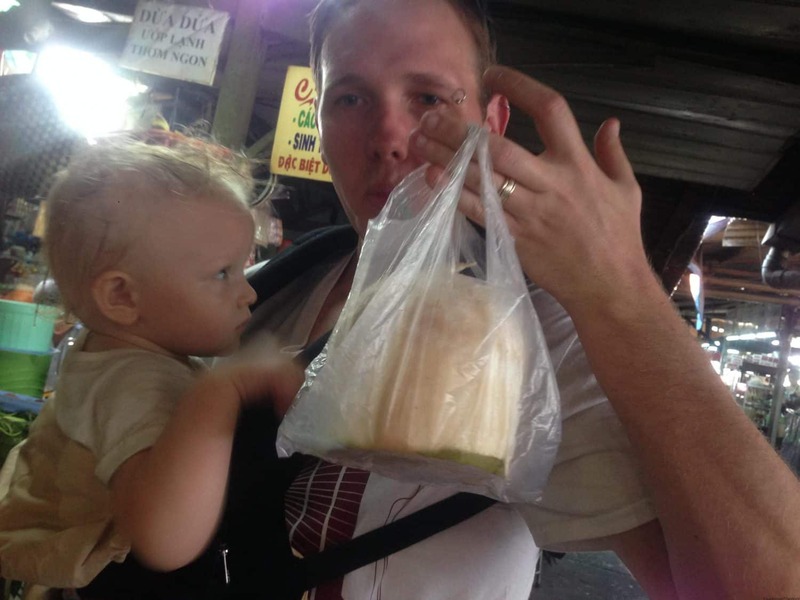 Simply not an option when travelling to Vietnam with a toddler. Well… maybe. But we weren’t that daring! 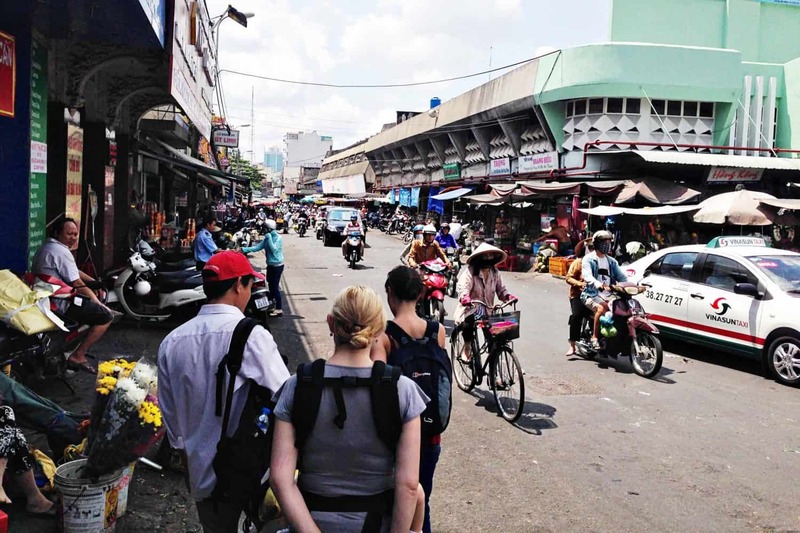 Actually, Saigon Street Eats also offer these bike tours at night, but we opted for their morning walking tour, the Pho Trail. In fact, one of the big selling points was the promise that the Saigon Street Eats tour would even show us how to cross the road. You may laugh now but seriously, have you seen the traffic in Ho Chi MInh City? We needed a lesson before we were game enough to venture far from our hotel… so we booked in our Vietnamese street food tour for the morning after our arrival. We were picked up from where we were staying, Hotel Equatorial, in Ho Chi Minh City on the morning of the tour by taxi, with our tour guide Vu greeting us at the hotel lobby. We jumped in the maxi taxi and were on our way, picking up two other tourists along the way. Right from the start, there is none of that usual tour guide awkwardness that commonly happens. Vu makes you feel at ease with his great sense of humour and the added bonus of having an understanding of ‘Aussie’ ways. He had us laughing in no time and looking forward to the experience. The first stop is to a popular pho restaurant for ‘breakfast’. 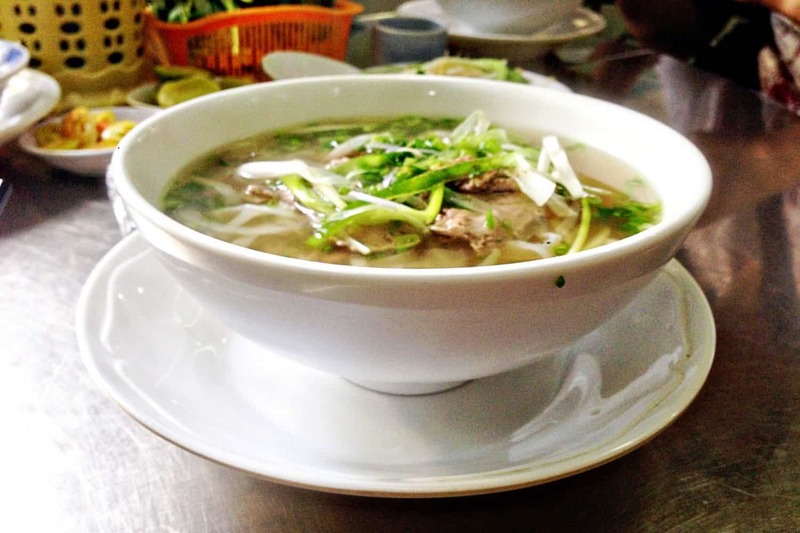 Pho is a traditional meal served for breakfast or anytime of day in Vietnam, but we’ll be honest, we cheated because we couldn’t imagine having noodles and soup for breakfast. We did have a light ‘western’ style breakfast at the hotel before the tour. This was potentially our first time having pho, but let me assure you, it definitely wasn’t the last. 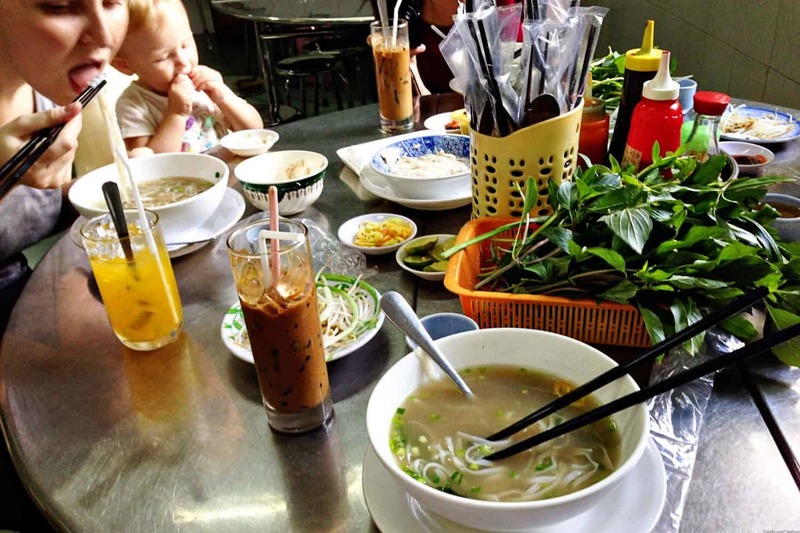 Plus most people will know kids love noodles, so even our toddler was loving her first taste of authentic Vietnamese food. But let me tell you, I am rotten at chopsticks. Always have been. Simon on the other hand thinks he’s some kind of pro and likes showing off his chop stick skills. He even brought his own nice set while over there but has only used them once since. This was also our main toilet stop before the walking tour began. Although don’t expect luxury bathroom facilities. We were off the tourist track! Vu was an excellent tour guide, with so much knowledge and sharing information that was actually interesting. 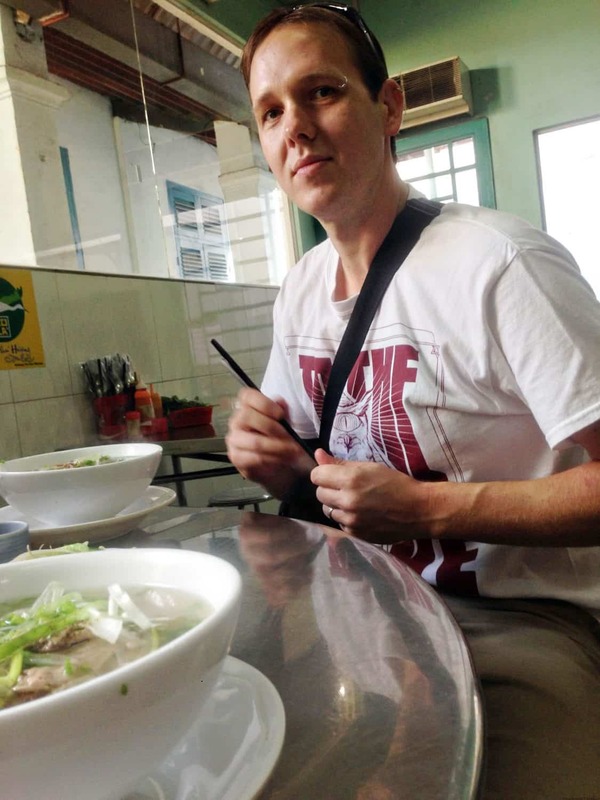 He explained local customs, regional differences in food and talked about so much more than just Vietnamese street food. The tour was a wonderful introduction to Vietnam in general. As we made our way to different back streets and shops, bakeries and street food carts, Vu collected an array of different foods. Some of it we had a bit of extra input in, such as the durian dessert bun Simon requested, despite Vu’s warning that it wasn’t to everyone’s tastes. A durian is a very stinky fruit in Vietnam that is actually banned from entering most of the resorts because it is so pungent. The sweet bun was not very appealing. One thing is for sure, Ho Chi Minh City is very humid. 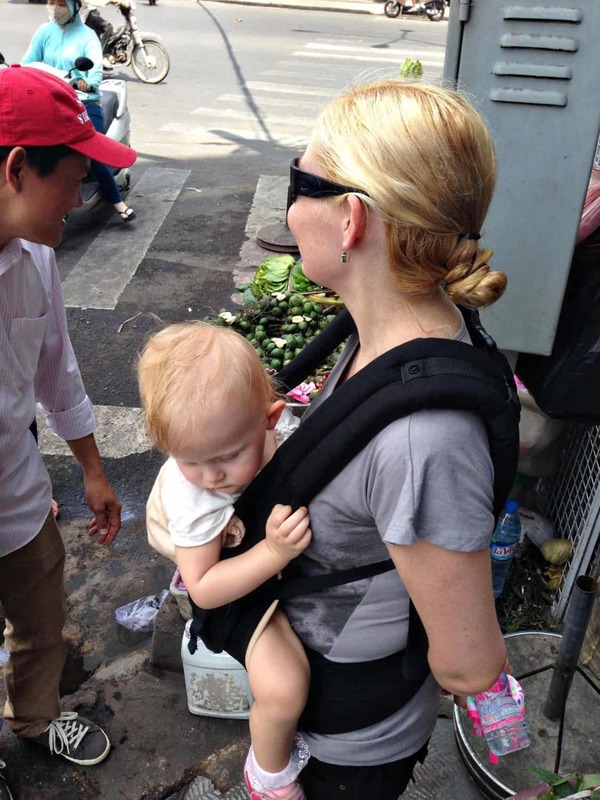 Being from Queensland, we are fairly accustomed to humid weather, but for the walking tour, we had our daughter strapped on with the Ergo baby carrier and it did get pretty hot and sweaty at times. We had quite a few hydration stops along the walking tour thankfully. One of them was for a sugar cane drink. We sat on the tiniest stools we ever did see. Kind of hilarious seeing my over 6 foot husband sitting on such a tiny chair. But the drink was the perfect refreshment for the 3 of us to give that energy boost. Plus you get to watch it being made right there at the street cart, with a super quick heavy duty juicing machine. There was also the chance to drink a coconut water fresh out of the coconut. Simon and Lliy enjoyed this. I’m not such a huge coconut fan. This was during our walk through a massive wet market, where stallholders were set up selling the freshest produce, meat and seafood. A huge hub of activity. After we collected lots of yummy bits and pieces, Vu took us to the grounds of a temple to eat lunch. There was some shade and a grassy area for our toddler to stretch her little legs after being stuck in the baby carrier all morning. Vu divided up different foods he had collected between each of us on the tour and we had ourselves a sort of picnic, getting an explanation on the food before we tried it. Some of it was great. A couple of items were a little more extreme though. But overall, enjoyable for the 3 of us and the other 2 tour participants. After lunch we visited the temple and learned a little of its history. We also had a chance to have our fortunes told for something a little different, with the fortune telling sticks. After the tour concluded, we hopped back in a taxi and were taken back to our hotel. By this time we were all pretty exhausted after walking in the heat for several hours, so it was pretty much straight to the hotel pool for a couple of hours. Find more family friendly attractions in Vietnam here. 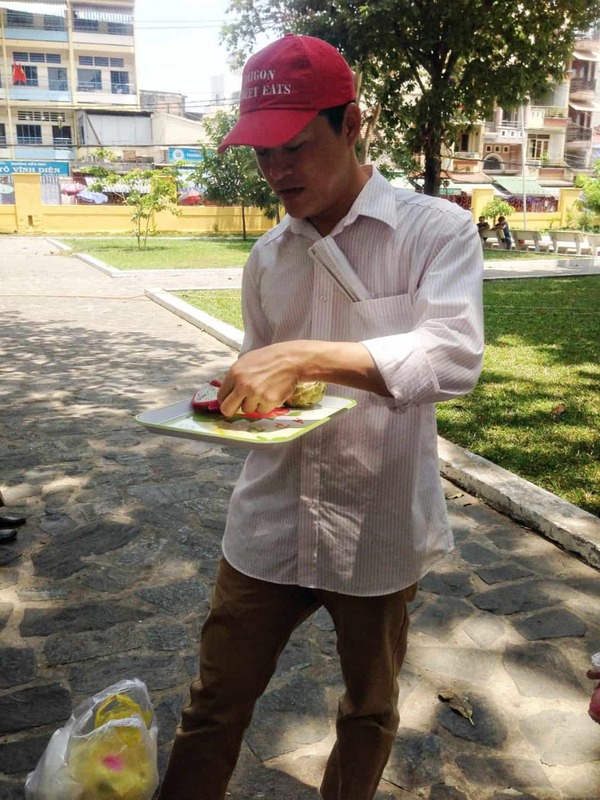 We would definitely recommend the Saigon Street Eats tour if you are wanting a chance to sample the real Vietnamese foodie delights (and learn some local customs and tips). Vu was lots of fun and it was an easy walk for us, even with the toddler strapped into the carrier. Plus she enjoyed sampling some of the street food too. And referring back to the website to write this post, there is a section in the frequently asked questions about whether kids are suitable for the tours. They referred to their youngest Pho Trail participant being a 14 month old who mostly slept in her carrier. That could be our Lily! She was indeed content to snooze while we walked. 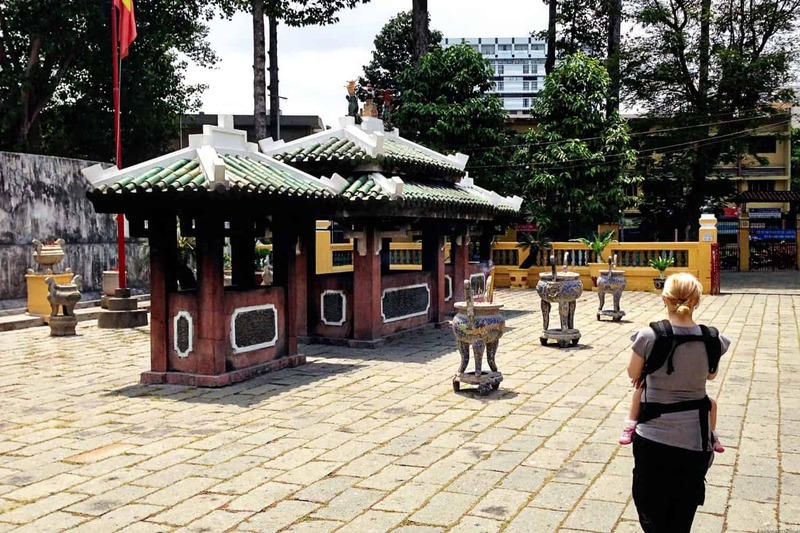 But the comfortable paced walk would be suitable for bigger kids who are happy to walk on their own, since strollers aren’t really an option in Vietnam with kids. Just remember to stay hydrated, wear a hat and sunscreen! The tours are between 3 and 4.5 hours long, depending on the tour, so no rushing through at all. They are leisurely and fun, with kids welcome, with reduced tour costs. Adult tour prices range from $40-$55US per person and group sizes are small. You will find more details on their website, but also pop over and visit Barbara’s blog. 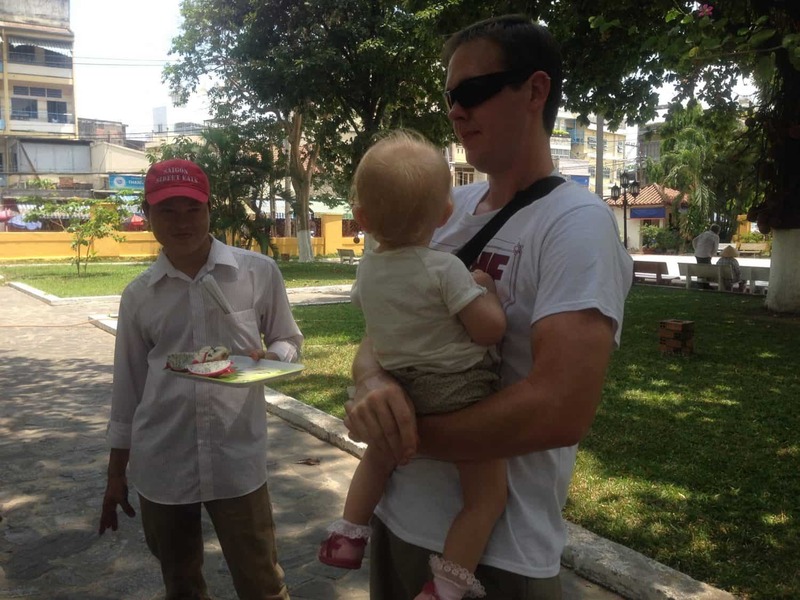 We never had the chance to meet Barbara, as she had just given birth to her second child, but it’s a great read to learn more about live in Vietnam from an expat perspective. Plus she is now a Fodor’s travel guide writer. Very impressive! Where is your favourite street food experience? I love that you took Lily along for this journey! What a fabulous way to spend a day as a family. Kids can go just about anywhere…. Love it! Thanks for being an inspiration to family travel. Thank goodness for baby carriers. Easy paced walking tour, but not for legs that little hehe she’s a pretty good kid (well… Aside from accidentally smashing the bottle of rum for rum balls I was making today…aahhhh). She was perfect for the tour though! That Pho looks amazing! 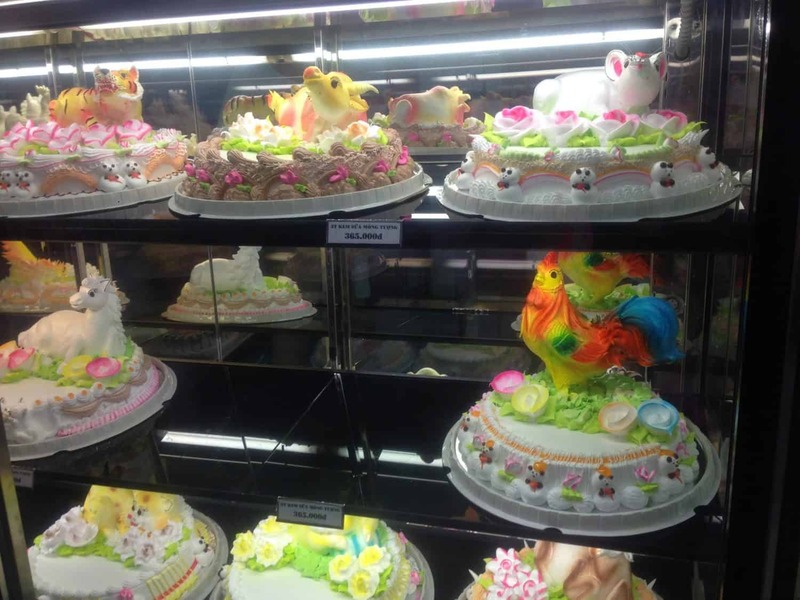 We had a very similar cake too for our wedding ceremony in Vietnam! we love food tours while we travel too. Food tours are the best. 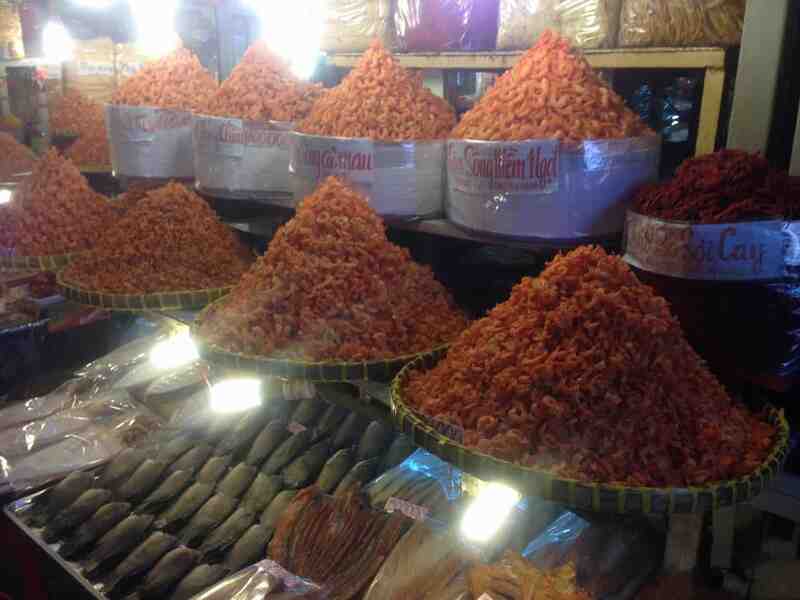 But I just love food hehe wow, married in Vietnam. That is seriously cool. Their cakes are beyond impressive. 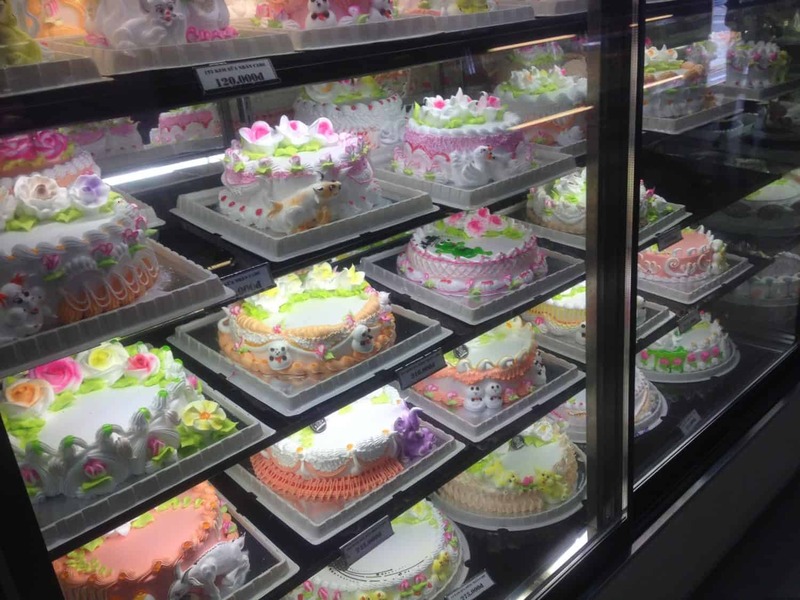 Im so glad that I found this post today, we are heading to Vietnam next week and I have been looking for a food tour that is suitable for kids! Its looks like you had a fantastic time and I will definitely be reading your other Vietnam posts for more inspiration. I loved the food in Saigon, what a simply perfect way to start your city journey and get acquainted with the food and the streets. I couldn’t believe how willing our then 18 month old and 3.5 year old were to try new foods there too (sadly an experience that hasn’t been repeated since but thankfully they both eat plain rice!!) may well look this tour company up when we return in March 2016!! Keri, we miss the easy to please child. These days every meal is a challenge… Except rice. It does always still do the job lol fussy little people. I dread what it could be like in Europe next year with her but at least in Poland she will be content with pierogi every day hehe the tour was great and we really recommend it! Fun & good food.